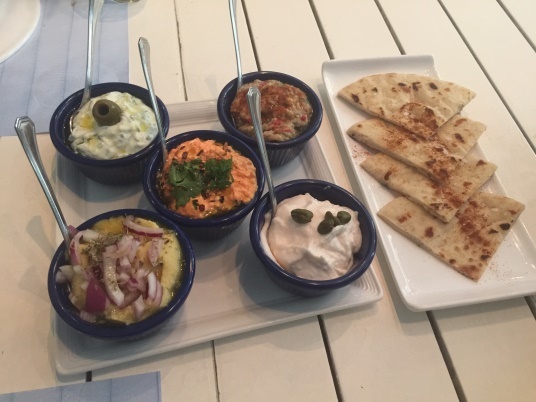 Nestled in the heart of Bukit Timah, you will find a Greek gem, Blu Kouzina, a family-friendly traditional Greek restaurant offering high-quality food and an authentic Greek and Mediterranean culinary experience. The restaurant is covered in décor which is all-things-Greek, in a combination of blues and whites. The secret behind the phenomenal flavours at this restaurant is its true-blue authenticity with oregano hand-picked-from-the-mountains, and sea salt and olive oil from Greece, the latter home-grown and extracted from Kalamata Olives. These organic ingredients are flown in to Singapore by the tonnes, and are used to marinate and cook most of the dishes. 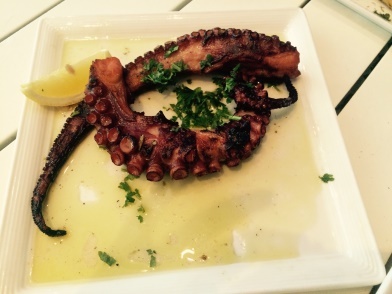 The very pleasant and friendly staff, some locals and some Greek, is another reason for the growing popularity of this restaurant, as they recommend dishes to you if they feel your order might be too monotonous. They help bring a whole lot of family tradition to the table, and encourage you to dine the Greek way by sharing the portions served amongst everyone. 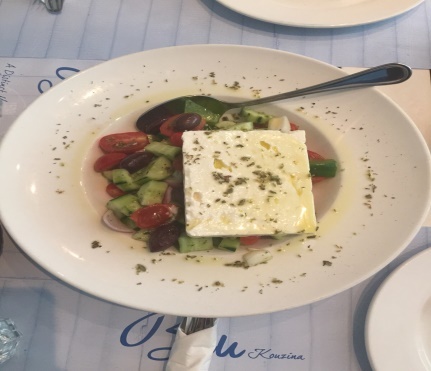 The restaurant may feel pricier than most of its Greek counterparts, but at Blu Kouzina, not only do they keep the Greek traditions alive, they also bring to you authentic flavours directly from Greece, and do not compromise on quality or size of portion. Greek feta cheese being the best in the world; white cod roe instead of the generic pink one sold in most restaurants and supermarkets; even the fish and almost all the beverages (including water and soft drinks) are imported from Greece! 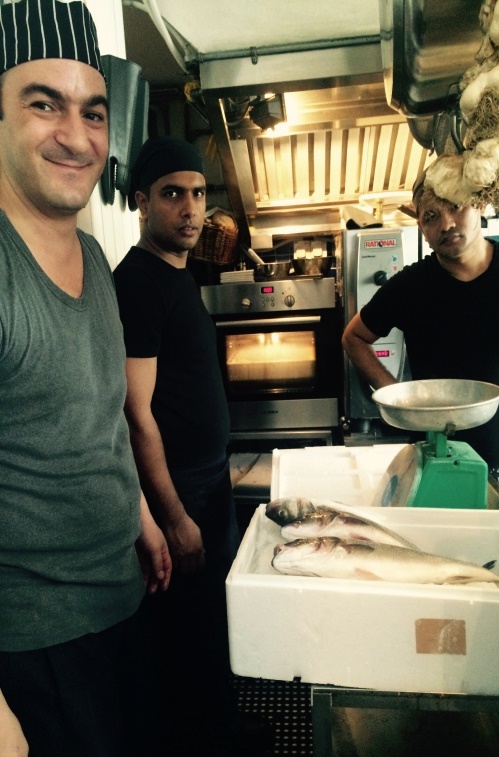 Fresh fish seabass, seabream and sardines are flown in every week from Greece or the Mediterranean, with lamb and beef from New Zealand. The only frozen item the restaurant uses is chicken, for health and safety reasons. Once welcomed by the friendly and attentive staff, customers can sit down to enjoy the rustic and relaxed environment. This setting is perfect for any social gathering, be it an evening meal with good friends or a romantic one with your partner. 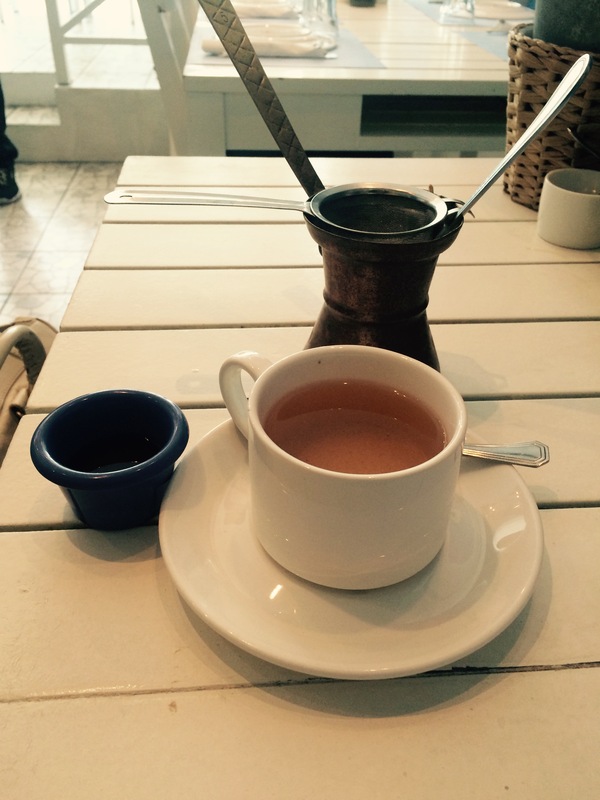 To cleanse the palette start your meal off with a traditional Greek mountain tea. Enjoy the delicate flavours of the tea leaves and enhance with a dash of pure Greek Honey, this is both calming and builds your appetite. 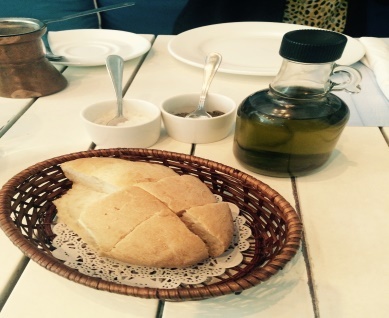 Freshly baked bread accompanied by Greek olive oil, infused with Greek sea salt and cracked black pepper. Who needs balsamic vinegar…..this is the new way to eat bread! Blu Kouzina has a fabulous selection of mezzes. The most indulgent is the creamy and clearly-fishy Taramasalata, made with white Cod Roe, a speciality fish from Greece – it is a must try. The best chops in Singapore, marinated in herbs (we think we tasted oregano) and olive oil! 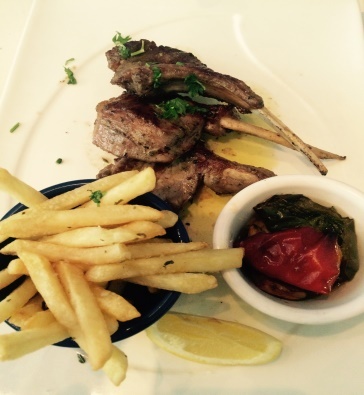 Blu Kouzina is renowned for its delicious succulent lamb chops, sourced from halal suppliers in New Zealand. This meat platters is served with French fries and roasted pepper, you will be back for more. 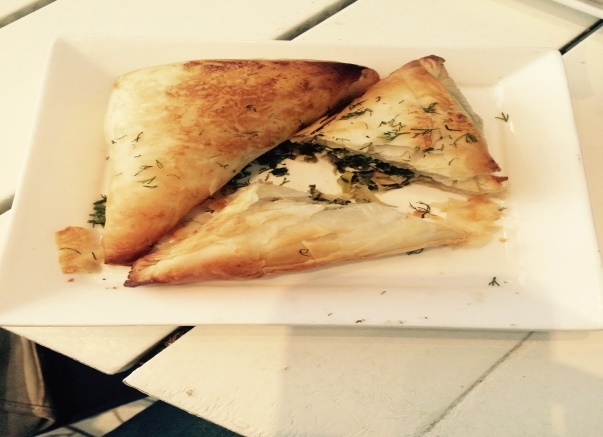 Stuffed with feta cheese and spinach flavoured with aromatic herbs, this brings the comfort food feel to the palette. The pastry was well bounded, and the flavours mild and fresh. A mouth-watering authentic Greek salad with feta nested on a medley of local vegetables with Kalamata olives. An explosion of flavours…..this side dish is a citrus delight! To sweeten your palette, a great choice to order is Bougatsa, a light and creamy pastry. For a more decadent alternative order the Greek yogurt. Drizzled with pure honey and a scattering of walnuts, it is a simple, yet beautiful way to end your evening meal. Blu Kouzina caters for parties and events, so if you are thinking of hosting a Greek themed gathering, or fancy serving something different at the next party, check out their menu on www.blukouzina.com/SG/menu.html. Why not take some of those flavours home with you to enjoy as you please? Their organic Greek coffee, extra-virgin olive oil, honey, feta cheese packed in brine and many other items can be purchased on site. You can purchase gift vouchers as well, to pass on to a colleague or friend for their special days. There are sufficient options for vegetarians, and the restaurant can customize dishes accordingly as well. 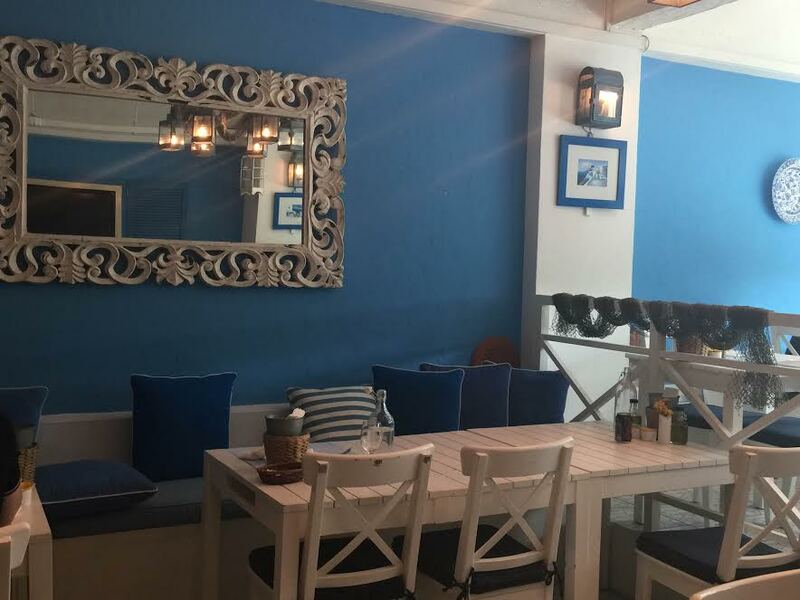 A cosy eatery, Blu Kouzina has limited indoor seating with a small outdoor space, so if you plan to visit, you might want to make a reservation. Also, the restaurant is not very accessible, and parking is limited, which the restaurant overcomes through its complementary valet service. At about $60++ a head, one truly does pay for premium imported ingredients, quality, freshness and an authentic Greek experience, which FUCHSIA found worth the price.